We’ve quickly learned successfully planning for a cruise can take time. If you’ve never been on a cruise before, and even if you have, it can be hard to plan for how much a cruise costs. The cruise fare is your biggest vacation expense. The costs don’t end there, though. You’ll have many smaller budget items that can add up quickly. To make matters worse, it takes time to discover all of these costs. Thankfully, we’ve come up with the perfect time-saving solution to help you budget for the typical costs on a cruise. My wife and I used our experience cruising, along with a ton of research, to come up with a list of the most common cruise costs people run into on their vacations. We compiled all of these costs into a free cruise budget printable worksheet. To get the worksheet, sign up for our email list below and you’ll gain access to this freebie and the rest of our freebies in the Money Manifesto Resource Library. Using the worksheet is pretty simple, but I think it helps to have some insight into how we created it and how we intended it to be used. 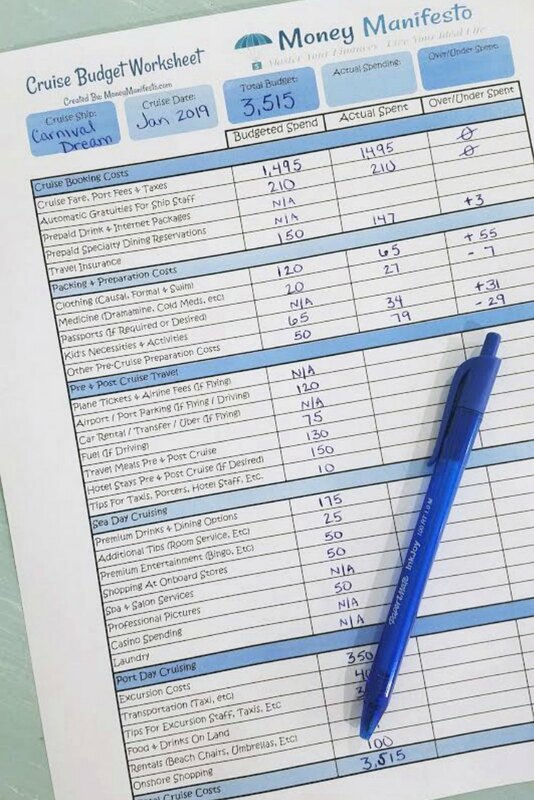 The worksheet is broken down into several parts based on different portions of the cruise planning and vacation process. First up are your cruise booking costs. You typically know how much these items will cost when you initially book your cruise or at a minimum before you leave. These also represent some of your biggest costs to budget for in many cases. Next up are packing and preparation costs. Many people love to decorate their cabins or buy cruise specific outfits for their vacations. While my wife and I prefer to spend our money cruising more often, others love these purchases because it helps build anticipation for their upcoming vacation. Unless you live right next to a cruise port, you’re either going to have to drive or fly to a cruise port to start off your vacation. For big families, this can add a major expense you definitely shouldn’t forget. We recommend arriving the night before the cruise begins to make sure unexpected delays don’t make you miss your cruise. The ship won’t wait for you if you’re running late. Once onboard your cruise ship, there are two types of days. Sea days are the days where you don’t stop in a port and port days are when you get to explore the destinations your cruise ship travels to. Sea days are some of our favorites because you get to explore the ship and everything it has to offer, but these days have very different costs than port days. When you’re on the ship, you’re a captive audience. That means cruise ships can charge higher prices for items you could typically get cheaper elsewhere. Make sure to research the pricing to accurately budget these expenses, especially if you’ve never been on a cruise before. Port days are a blast because you get to explore the great destinations you’re visiting, but they can get expensive. Excursions allow you to take part in fun activities, but can easily add up to hundreds of dollars for a family. Make sure you research your destination to plan what you’ll do in advance. A bit of research on the internet or asking the crew what their favorite things to do in port are can help you find cheap but fun activities. Using the columns is pretty easy, too. The first column is for the amount you’ve budgeted for your trip. The middle column is where you write down your actual expenses after you incur them. Then, you can use the third column to determine if you came in under or over budget after your vacation ends. This column is super important to help you figure out where you under or overestimated to help you budget better for future cruises. After all, the best vacations are the ones where you don’t have to pay for them after you get home. Figuring out how much to budget for each category on the worksheet can be hard. Thankfully, we have plenty of resources to help. First, make sure to read about the 11 hidden costs you may run into on a Carnival cruise. Even if you aren’t cruising on Carnival, these expenses usually pop up on most major cruise lines. Next, check out our 55 secrets every cruiser should know. These tips and tricks can help you find ways to save money on your cruise and figure out what you should be budgeting for. Finally, check out our previous cruise trip cost reports. These reports detail every penny we’ve spent on the cruises we’ve documented below. You may have noticed a few of our trip reports mention we got a free or heavily discounted cruise. We’ve been able to occasionally cruise for free thanks to the power of credit card rewards and sign up bonuses. As a word of warning, you shouldn’t try to use credit card rewards to get free cruises if you struggle with credit card debt. The rewards you earn won’t likely exceed the money you end up paying in interest and fees. However, if you’re like us and never pay a penny in credit card interest, you can’t pass up this awesome hack to get free or cheap cruises. Here’s what you need to know if you want to learn how to use credit card sign up bonuses and other rewards to cruise for free. Once you understand how it works, here’s a list of the best credit card sign up bonuses that are currently available. Look through this list to see which would be best to help you save money on your future cruise. 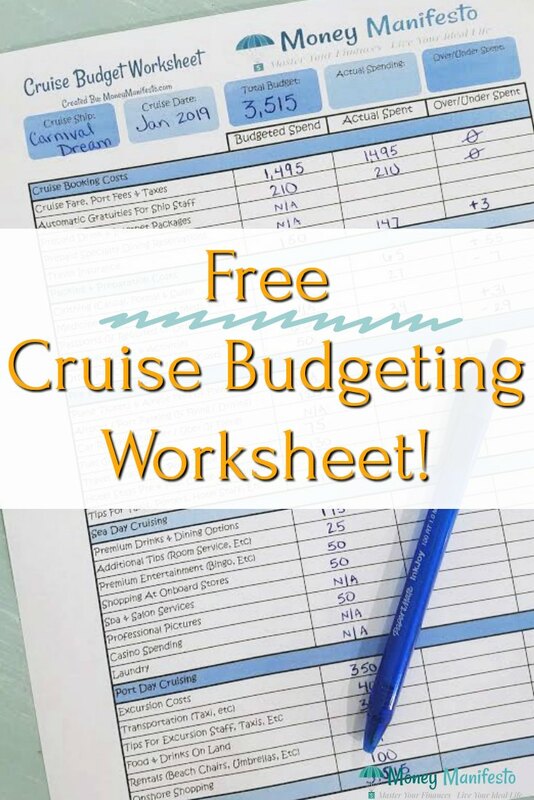 What questions do you have about the cruise budgeting worksheet? What’s your favorite way to save money on a cruise? Let me know in the comments! 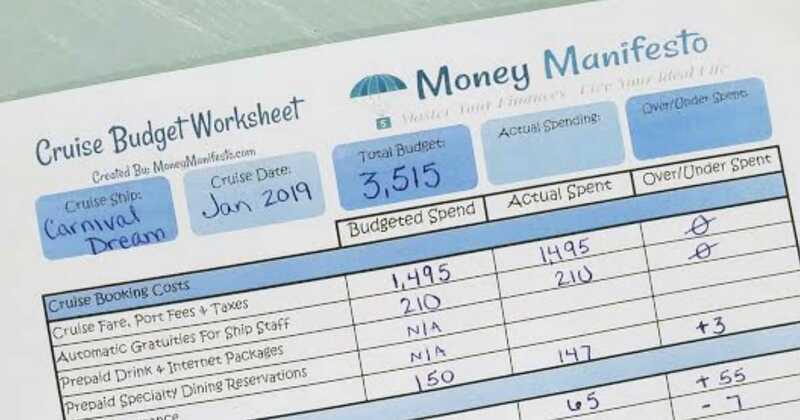 The post Budget For Your Next Cruise With Our Free Printable appeared first on Money Manifesto.